Nymphaea nouchali is a clump forming perennial with thick, black, spongy, tuberous rhizomes anchored in the pond mud by spreading roots. 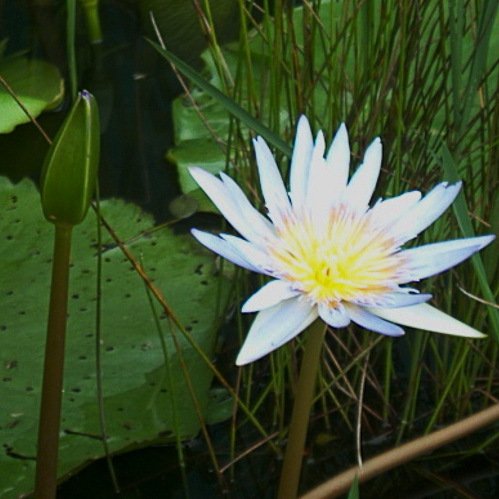 Deciduous waterlily with glossy, circular, floating leaves that turn lovely colours in autumn. Nymphaea nouchali is a clump forming perennial with thick, black, spongy, tuberous rhizomes anchored in the pond mud by spreading roots. The glossy, circular, floating leaves, up to 40cm in diameter, that turn lovely colours in autumn. before it goes dormant. The large, elegant blue flowers are held well above the water at the tip of a sturdy green stalk and appear almost constantly from spring until the end of summer.The flowers open in early to mid-morning and close completely in late afternoon and stay closed all night. Nymphaea nouchali should be planted in sun or light shade. The pollination mechanism, albeit macabre, is fascinating to watch. Used in traditional medicine for coughs and colds.